iEARN-Belarus сегодня – это сетевое сообщество педагогов, школ, организаций и учащихся (iEARN - Belarus community), работающих в образовательных Интернет-проектах. и живущих в различных регионах (Минск и Минская область, Гродненская, Гомельская, Брестская, Витебская и Могилевская области) , городах и поселках Беларуси. 3. GLOBAL CITIZENSHIP SURVEY. A project for students ages 15-18 to share their ideas about global citizenship through an online survey. See the iEARN Global Citizenship Survey project page. Have any questions or ideas to enrich the project? Please post them in the project forum, or email Этот адрес e-mail защищен от спам-ботов. Чтобы увидеть его, у Вас должен быть включен Java-Script or Этот адрес e-mail защищен от спам-ботов. Чтобы увидеть его, у Вас должен быть включен Java-Script in the Netherlands. 17. iEARN-TAIWAN TO HOST THE 18TH ANNUAL iEARN CONFERENCE AND 15TH ANNUAL YOUTH SUMMIT, JULY 17-23, 2011. The theme will be "Green Tech, Green Life, Great Era." iEARN-Taiwan announces "We are thrilled to invite all to Kaohsiung, Taiwan to join the 18th International Conference and 15th Youth Summit. Taiwan is a beautiful island with environmental and cultural diversity. Our foods, night markets and fruits are something you don't want to miss! 2011 iEARN Annual Conference will be held in the 2nd biggest city of Taiwan, Kaohsiung City. Kaohsiung is a charming harbor city with its hospitable citizens, pleasant subtropical climate and gentle ocean breeze. Come to explore the passion and vitality of Taiwan!" See a video preview, and stay tuned for details. Send brief announcements to Этот адрес e-mail защищен от спам-ботов. Чтобы увидеть его, у Вас должен быть включен Java-Script . 1. INCLUDE YOUR iEARN PROJECT IN THE 2010-2011 PROJECT BOOK!!! If your project is already active and will continue, please submit an updated template to Этот адрес e-mail защищен от спам-ботов. Чтобы увидеть его, у Вас должен быть включен Java-Script . If it is a new project, please first post your project idea in the Teachers Forum or, for students, the Youth Forum. Once you find partners, complete the project template below and send it to Этот адрес e-mail защищен от спам-ботов. Чтобы увидеть его, у Вас должен быть включен Java-Script as soon as possible, but no later than the FINAL DEADLINE of August 2, 2010. This project template can be submitted in any language, and is available in multiple languages in the translated versions of the iEARN Project Book. 5. iEARN-MOLDOVA TO HOST FLEX STUDENTS WITH DISABILITIES FROM EURASIA -- SEEKING US PARTNER SCHOOLS FOR COLLABORATION. This July, iEARN-Moldova is hosting the next round of FLEX students with disabilities from Eurasia in collaboration with the American Councils for Education in Moldova (read more). We would love to partner with an US school to assist FLEX finalists with visual and physical challenges in their struggle to improve their English speaking skills, while studying the American culture and life style. For more information, please contact iEARN-Moldova Representative Этот адрес e-mail защищен от спам-ботов. Чтобы увидеть его, у Вас должен быть включен Java-Script . 9. REGISTER NOW FOR THE 17TH ANNUAL iEARN CONFERENCE AND 14TH ANNUAL YOUTH SUMMIT IN BARRIE, CANADA, JULY 12-17, 2010. Please note that registrations need to be finalized and paid in full by June 10th in order to reserve rooms at Georgian College, the conference venue. Check out a video preview and visit the conference website at www.iearn2010.org for more information and to register. Participation is open to all. iEARN encourages attendance by all who want to make their classes more global and who believe that students can be empowered to make a difference in the world when they work together on collaborative online projects. Among countries registered so far: Armenia, Argentina, Australia, Azerbaijan, Bahrain, Belarus, Brazil, Cameroon, China, Cote D'Ivoire, Egypt, Ethiopia, France, Gambia, Georgia, Ghana, India, Iran, Israel, Italy, Jamaica, Japan, Jordan, Kenya, Korea, Lebanon, Liberia, Malaysia, Mali, Mexico, Morocco, Nepal, Netherlands, Niger, Nigeria, Oman, Pakistan, Palestine, Philippines, Poland, Puerto Rico, Qatar, Russia, Rwanda, Senegal, Sierra Leone, Slovenia, South Africa, Spain, Sri Lanka, Suriname, Taiwan, Tanzania, Togo, Trinidad and Tobago, Uganda, USA, UK, and Yemen. 5. iEARN ANNIVERSARY VIDEO AVAILABLE IN MULTIPLE LANGUAGES. The iEARN Anniversary Video is available with multilingual captions through dotSUB.com, a browser based, one-stop, self contained system for creating and viewing subtitles for videos in multiple languages across all platforms. Bengali, Spanish, Italian, and Arabic translations of the iEARN Anniversary Video subtitles are already underway or completed. We would love to have the video captions in 50 languages!! Can we do it? Interested in helping to provide additional translations? Contact Этот адрес e-mail защищен от спам-ботов. Чтобы увидеть его, у Вас должен быть включен Java-Script . Students and Teachers around iEARN have asked what they can do to help relieve the suffering caused by the disastrous earthquake in Haiti. Many organizations and millions of people have responded with food, water and other relief supplies. It’s now time to start to re-build. Getting young people into schools so they can receive an education is one of the highest priorities. The iEARN global community is ready to assist in getting students back into schools after such situations, as we have done with other natural disasters like the earthquake in Bam, Iran and the tidal waves/tsunamis that hit South and Southeast Asia several years ago. 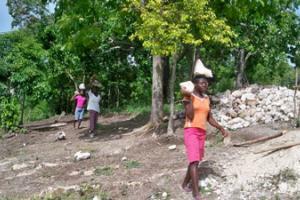 For more info, see http://iearn.org/supportforhaiti.html or read below. Students and teachers involved in the Natural Disasters Youth Summit (NDYS) have created an NDYS Fund in which there is money raised by iEARN students and from which schools can apply for financial assistance in the rebuilding after such disasters. iEARN participants have already raised over US $12,000 for such emergencies in past requests. Fatem, a group in Haiti, has asked for our help to help equip schools in the Mirebalais area, outside Port-au-Prince as part of its “Learning to Read and Write is a Right” program. 12 schools need help to meet the huge numbers of refugee children who have been made homeless by the earthquake. These schools need to be able to serve hot food to meet basic needs such as food and nutrition. It is clear that a child cannot learn if they cannot sleep or eat on a regular basis. In spite of many challenges, Haitians express a remarkable and widespread thirst to learn. Education is high priority for parents and, despite family poverty, tight-knit families demonstrate a passion and willingness to sacrifice in order to send their next generation to school. School feeding programs have the potential to combat hunger and support nutrition through micronutrient-fortified food and de-worming. They provide an incentive for families to send their children to school—and keep them there— while improving their children’s education. Food is available from international organizations, but kitchens need to be built to enable schools to provide education and nutrition. A school kitchen can be built in 14 days and costs about $11,000, which includes the oven, roof, staffing for 10 months, etc. Can we build at least one school kitchen? Fatem will arrange for feedback to iEARN students from the schools newly equipped with a kitchen. On the donate form, indicate that it’s for a Haiti School Kitchen. The NDYS members in Trinidad and Tobago have also created an account for donations. They will work with UNICEF focus on health and trauma issues in assisting Haitians recover from this tragedy by creating a trauma center. Refer to NDYSTT in the wire transfer. Children in Haiti hit by a massive earthquake risk long-term physical and psychological trauma unless they are treated quickly. Up to two million children could be affected by the earthquake - children under the age of 18 make up nearly half of Haiti's 10 million population according to UNICEF. As you all know, the people of Haiti have recently suffered a terrible catastrophe. It is times like these that the basic necessities such as food and water are vital to the well-being of millions of Haitian residents. Unfortunately, they lack the resources to cook their food. They would benefit immensely by having solar cookers to allow them to cook their meals and pasteurize water by using the widely available power of sunlight. Together with SunOven.com, Feed My Starving Children, and Friends of Haiti the students and teachers at the iEARN school Miami Country Day School in Miami, Florida are trying to send as many solar ovens as possible to help sterilize medical instruments and to serve food in the newly established tent cities. 1. Bridge of Generations Project connects youth and elders for technology training and mentoring. 2. Check out new artwork from Pakistan in the Calligraphy Project. 3. New proposed project from educators in Sierra Leone and Slovenia - Bring Them to the Light. 4. Interested in a new Children's Rights project collaboration with UNICEF? 5. Students commit to reduce CO2 output as part of Our Footprints, Our Future Project. 6. Collaboration Centre Tip - Update Your Profile! 7. YES Exchange and Study Program Alumnus from Pakistan featured in New York Times guest blog. 8. Research shows positive impact of iEARN Professional Development Program in Delaware, USA. 9. iEARN-Oman participating in Global Education Forum Expo in Dubai, UAE, February 23-25, 2010. 10. YouthCaN Environmental Conference in NYC, USA, April 24-26, 2010. 11. Register for 17th Annual iEARN Conference and 14th Youth Summit in Barrie, Canada, July 12-17, 2010. 12. 2010 Natural Disaster Youth Summit in Turkey, August 23-27, 2010. 13. iEARN-Russia and iEARN-Belarus host joint Adobe Youth Voices Workshop, January 28, 2010.